I've been riding the kale train for a while. 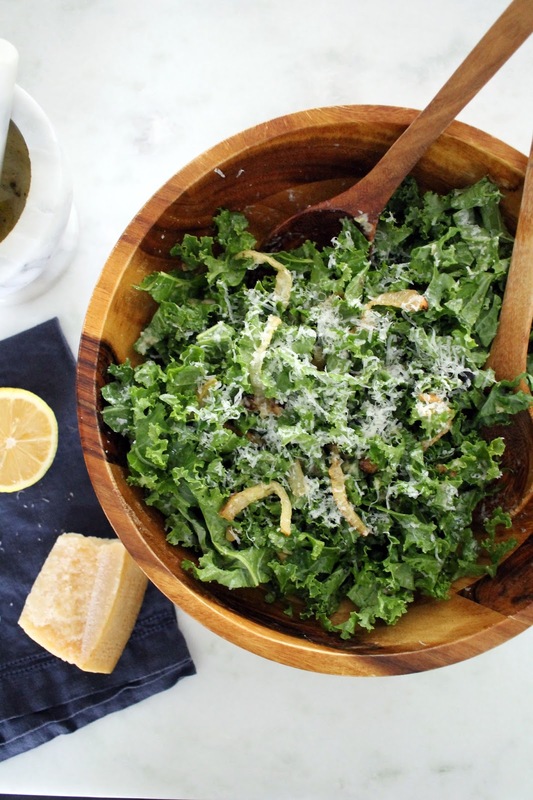 I'll eat it in any form, but a really good kale salad is my favorite. Over the summer I complied a list of all my coworkers favorite summer recipes and my boss happened to share the most killer kale salad. I love the original version, which is filled with delicious bacon and croutons, but it is a lot of work. Roasting the onions even seems a bit frivolous for a salad, but trust me it is so worth it. So, I paired it down to the components I really love, like this sharp vinaigrette and roasted onions, and made it easy to create during a busy week. I like to pair it with roasted salmon for a healthy meal. 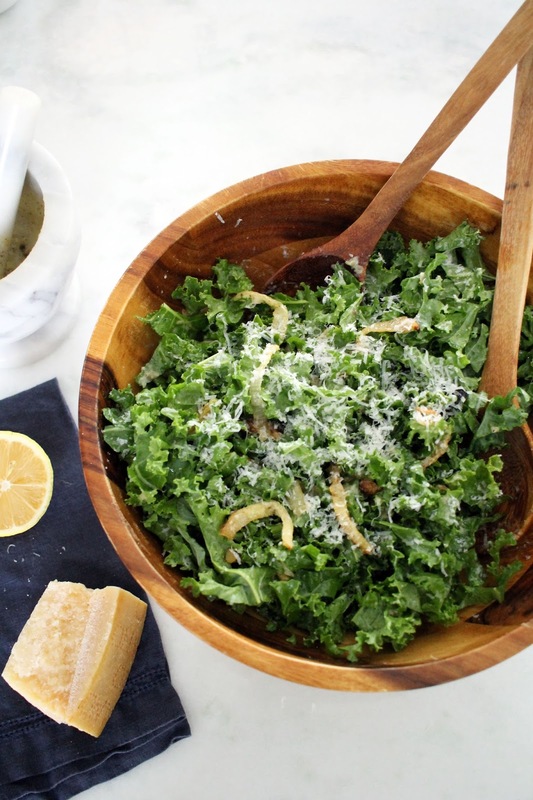 If you have a kale salad recipe you love, I would love to hear. Please, share in the comments below. 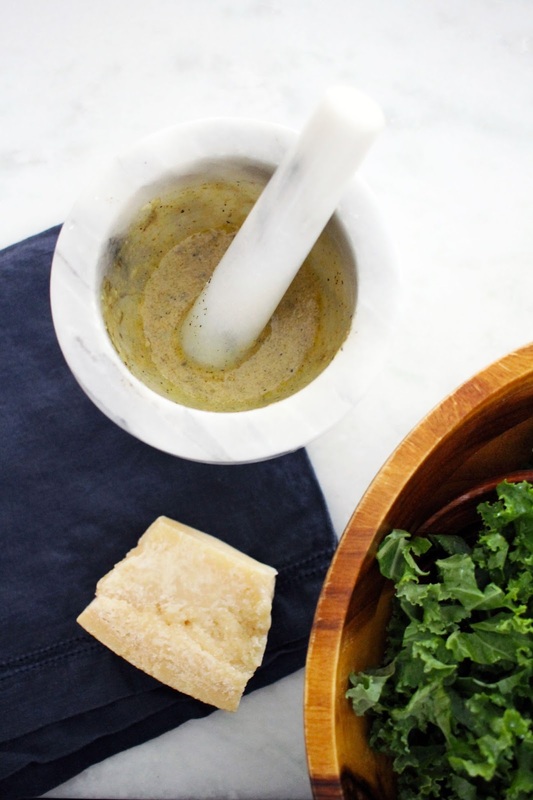 Combine garlic and capers in a mortar and pestle and grind until a thick paste forms. Then, add djion mustard, red wine vinegar, and lemon juice. Slowly whisk in extra virgin olive oil and whisk until emulsified. Season with salt and pepper and set aside. Preheat oven to 325 degrees. Slice onions and place on a rimmed baking sheet. Season with salt and pepper and toss to coat. Roast for 1 hour, turning onions every 15 minutes to make sure they cook evenly. Wash and dry kale, and then cut into thin strips. 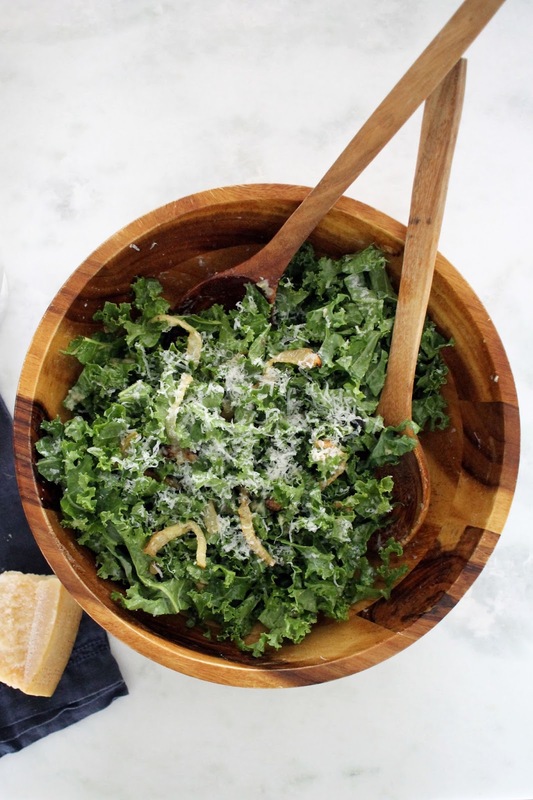 Place kale in a large salad bowl and toss with warm onions. Allow the onions to let the kale wilt and then toss with dressing. Toss with desired amount of parmesan cheese and pepper. Serve immediately.